Salmon and cream cheese are a classic bagel topping, so why not mix them together along with all of the other delicious topping like capers, red onion, and dill and form a spread? Schmear it on top of an everything bagel or you can use it as a dip for bagel chips or crackers. 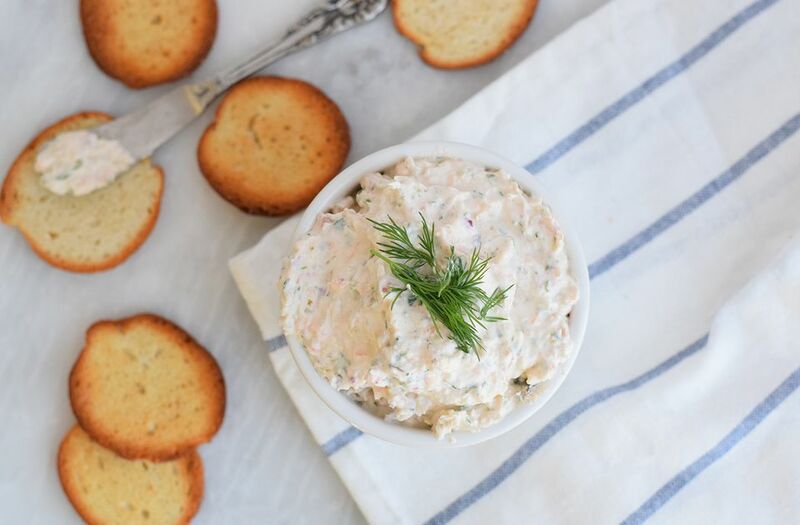 Serve it up at a spring brunch or turn it into little canapes by loading the smoked salmon dip on top of sliced baguette for a special evening event. This dip has a nice tangy zip from the lemon juice and prepared horseradish. The fresh herbs give an earthy and fresh taste. You can add a little heat from some Tabasco if you're feeling up to it. There are a ton of variations below to help make it all yours. Make the dip ahead of time to allow the flavors to blend a little before serving and put it out chilled. Any way you serve it, this dip is sure to make an impression on everyone's palates—even those who may not usually be a fan of smoked salmon. Place 2 ounces of the salmon and the remaining ingredients in the food processor and blend until completely combined. Make sure the cream cheese has been softened so that it blends together easier. Chop the remaining 2 ounces of the smoked salmon and add it to the dip. Gently fold the salmon into the blended mixture. Serve the dip with bagel chips or crackers. Enjoy! Pick the best possible smoked salmon you can find. Since this dish is so simple, you need high-quality ingredients. Typically, wild caught salmon is the best quality, but you can find some very decent farm-raised varieties as well. Make sure you like how it tastes before (try a small piece by itself) before adding it to the dip. Feel free to omit the parsley and dill. If using, always include fresh herbs if you are adding them to the dip. They make the dip look bright and taste fresh. The dried variety are not a suitable substitute. Make your own bagel chips! Slice a few day-old bagel into thin rounds. Spray them with a little cooking spray or brush them with olive oil. Place on a baking sheet and bake them in a 375 F oven for 20 to 30 minutes or until golden brown and crisp. Using Greek yogurt instead of mayonnaise for an even tangier dip. Add Worcestershire sauce for a deeper flavor. Use homemade cooked smoked salmon instead of a cold, raw smoked salmon. Add two sliced scallions or a handful of chives to the herb mix. Add in some caramelized onions for a nice sweetness. Add in some lemon zest along with the lemon juice. Make it spicy by adding some Tabasco or crushed red pepper flakes. Serve a little slice of the smoked salmon on top of the dip in the dish for a pretty presentation.